The Garden Cottage is a fully renovated four bedroom home with a large master bedroom and bridal suite. The suite includes a King sized bed and an en-suite bathroom with a garden tub and full shower. There are 3 additional bedrooms with queen beds and one additional full bath. The large, fully equipped kitchen opens onto spacious dining and living rooms. The dining room features a farmhouse table for your whole group to gather around. The living area boasts comfortable seating to help you relax while enjoying a 50" flat screen TV, satellite TV, and full sound system. About a 1/4 mile down a tree-lined road, the Three Sister's Cabins are located adjacent to the pool and playhouse area. These cabins are each equipped with a small kitchen area (small refrigerator, sink and microwave) a full tile bath with tub/shower and a bedroom and living area. Upstairs there is a sleeping loft with a queen size bed. These cabins all have individual heating and cooling units, granite counter-tops and a table for eating or playing games. The cabins are located near each other, and are within a few steps of the pool, outdoor shower and children's playhouse. There is a gas grill in this immediate area as well and each cabin has eating utensils and dishes. 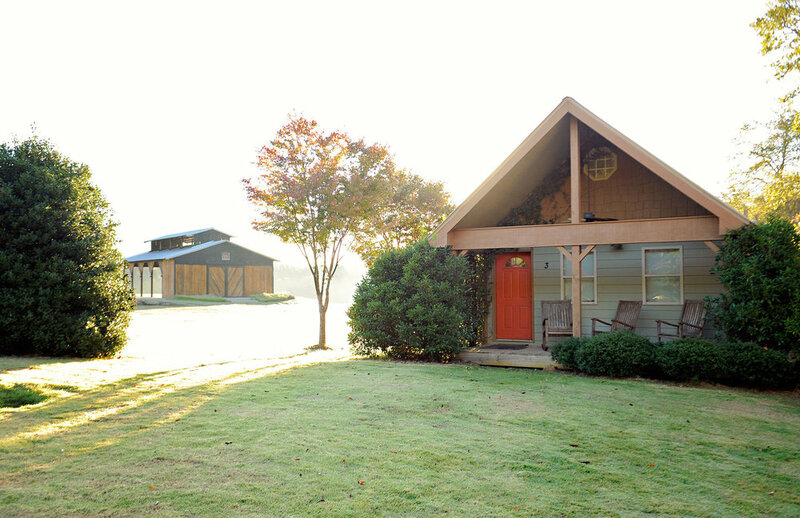 The cabins are perfect for family reunions where families want to be together, but enjoy some privacy as well.